The Library of Birmingham opens 3 September as an ambitious step change in the concept of the library as a focus of learning and participation. The new building, designed by Dutch architects Mecanoo, replaces the adjacent 1974 brutalist concrete central library, which is to be demolished. 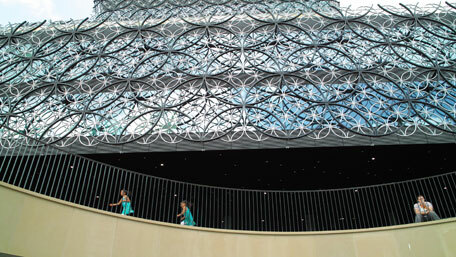 The Library of Birmingham, integrated with the REP theatre, has been developed from an educationally focused brief as a place of learning and community rather than a ‘traditional library model’, says Francine Houben, who led the design project. It includes several auditoriums, learning spaces and its own library theatre. 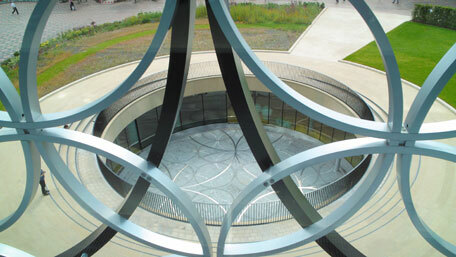 A series of interlocking rotundas draws visitors into the library and provides ventilation and natural light throughout the building. These circular voids provide enticing sightlines to the top of the building, the first of which is the outdoor amphitheatre extending into Centenary Square to provide a performance space. The archives now occupy the golden box over two levels of the building. The book rotunda forms the heart of the building, ringed by four levels of cantilevered circular balconies spread over three floors, each providing access to different parts of the bookshelves. 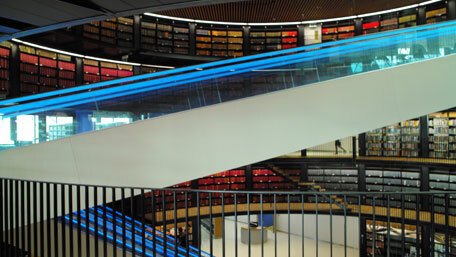 Escalators zigzag across the space, providing stunning views of the library and giving access to over 400,000 books, more than double the amount previously on show in the old library. BREEAM excellent rating, skyline views of the city and garden terraces all add up to something more than a building enclosing a library. Brian Gambles, Director, Library of Birmingham, sums up the aims and ambitions for the new library: ‘We wanted an open, accessible and welcoming space – a democratic space that would blur the line between the interior and exterior to become part of the public realm of the city. Facts, images, video on the project website. 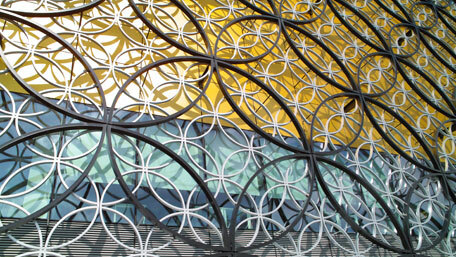 The Library of Birmingham website. Photo gallery on the Guardian website.